We encourage participants to explore different ways to perform the key elements of a solo broom dance, including balances, stepping over a broom on the ground, passing under the leg, throws, swings, and percussing with the broom. If there is time, we will show some moves for two dancers – we might be able to expand this into a second workshop, with sufficient notice. We ask participants to be aware of other people around them and work safely. We do not teach a “traditional” set dance: the objective is to encourage participants to create a dance that is personal to them. This workshop can be enjoyed by skilled or moderately able dancers from a wide range of dance backgrounds. Click to see our workshop notes, with video examples. (Read about bacca pipes on our Dances page) We can offer one or more sessions based on solo patterns, or dances for up to four dancers using the same set of pipes (which may actually be masking tape on the floor). In either case, we cover the basic patterns possible on the pipes and suggest ways to structure a dance; we can also introduce alternative stepping. We do not teach “traditional” bacca pipes dances. There is less scope for experimentation in this workshop, but we celebrate interesting deviations from the moves we teach! This is a very stimulating workshop for experienced and skilled dancers from a wide range of dance backgrounds; however, we are used to giving extra help to novices who turn up, so they still get something from the session without holding up other participants. Fast learners are given extra moves to try. Crew members have been winners in the jig competition at Sidmouth on several occasions and we use our experience to show people how to create Cotswold morris jigs with interesting structures and personal touches. We start by teaching a conventional two-person jig structure, and then introduce variations that reduce repetition and add interest; we also explore alternative transitions from one dancer to another, and ways to embellish the standard slow steps. We do not promise that participants will win the jig contest. 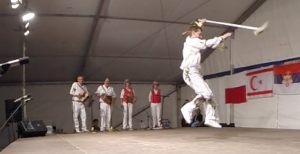 This workshop is suitable for moderately experienced Cotswold morris dancers only. We can also offer a Meet The Team show, in which we can perform dances and explain the thinking behind the Crew and our approach to creating dances; and also a talk, possibly with a practical element, on putting together an entertaining show – based on our experiences of creating The Big Caper with Berkshire Bedlam Morris and our own structured street shows. We are always open to ideas and special requests. 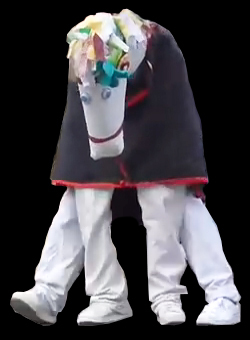 For Sidmouth Folk Week, we ran a session on morris fooling: we brought lots of toys, and experimented with funny walks. The ideal time for a workshop is 90 minutes; less than an hour is too short for anything more than a “meet the team” demonstration, with some opportunity for people to join in our easier dances. The broom dance and morris jigs workshops both require large spaces; bacca pipes can be taught in a smaller hall. We are happy to lead workshops as part of our contribution at events where we are also performing; where an event is well established and funded, we would appreciate being paid reasonable expenses (we thank Chippenham Folk Festival, who effectively paid for all those brooms). If you wish to book us only to teach, then we might expect a realistic fee and/or expenses, depending on the nature of the event and whether yours is a deserving cause we wish to support. Performance bookings are likely to take priority.